City Council president Joan Shannon is crying foul over a television campaign attack ad that targets, quite literally, Mayor Miro Weinberger, a fellow Democrat. Greg Guma, an independent candidate who considers himself a peace activist, has been running on WPTZ an ad, produced by his son, that criticizes Weinberger as being overzealous about developing Burlington. In an email to reporters Friday afternoon, Shannon described Guma's claims as "absurd and inaccurate," but she said she was particularly offended by a still image (pictured above) of Weinberger with a target on his face. A gunshot goes off as the video cuts to a view of the city, and a menacing voiceover states, "Development Mayor Weinberger is putting a target on the entire city for speculators, corporate vultures and chains only interested in profits." Shannon wrote in her email, "I urge Greg Guma to stop airing the ad immediately, so we can go back to the kind of honest, fair, civil debate that Burlingtonians expect from their politicians. Debating the issues and visions for Burlington is an appropriate debate to engage in. Putting a target on anyone’s head followed by the sound of a shot is something we all should be speaking up against, no matter our views on the mayor or development." 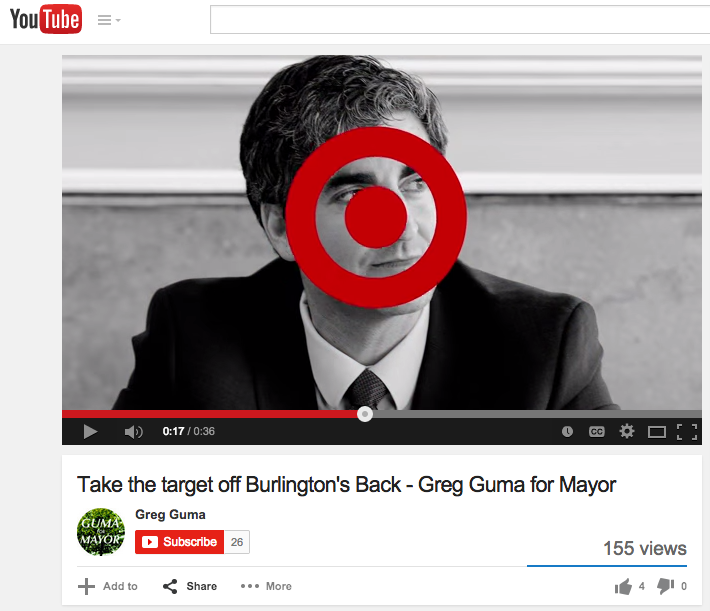 Guma pulled the ad from YouTube, saying the Burlington Free Press contacted him over copyright concerns regarding a photo he used. He said he was considering removing the target image from the ad altogether. The target superimposed on Weinberger's face is the logo for the Target retail chain. It's a reference, Guma explained, to investor Don Sinex's suggestion that he'd like to bring a Target to the Burlington Town Center mall as part of a $200 million redevelopment project. Before he pulled the ad, Guma defended it to Seven Days, saying, "It is a humorous ad that uses images that are exaggerated to make a serious point." As for that gunshot? Guma dismissed it as one of multiple special effects featured in the short video. "There's the bulldozer special effect, there are birds tweeting. It is one special effect." "If Miro feels threatened by that certainly he could tell me that," Guma added. No word on whether he's threatened, but the mayor — like Shannon — did not find it funny. Asked to comment, his campaign manager Jen Kaulius responded, "Mr. Guma's ad is offensive and inappropriate and has no place in our community."